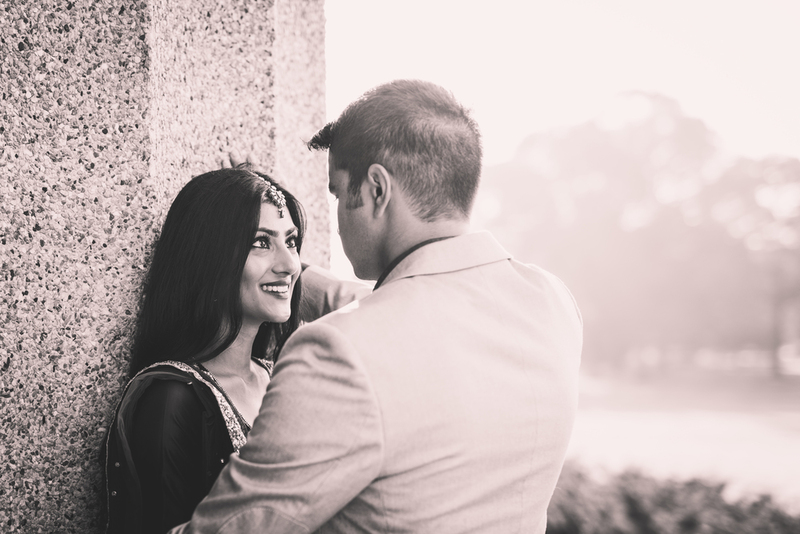 Sarin, Richa and I went to several places to photograph this epic engagement session one early Sunday morning. These high school sweethearts met me at 6:30am to also meet the sun rising over Nashville. This particular session had threeideas in mind. First we'd celebrate their heritage with RIcha wearing a traditional Indian outfit called a lehenga. We met at The Parthenon at Centennial Park in Nashville, TN. Richa's dress was vibrant and was gorgeous to see flow as Sarin twirled her around. The pillars of the Parthenon created an incredible background for any image. Next was Sarin's turn to have dramatic, James Bond themed look to the photos. We took advantage of the pillars of the Parthenon, but then walked around the park to also capture them by the water and an old train. The main purpose of the James Bond theme was incorporate a gun and Sarin's Porsche, but that would be a bad decision at a public park. So we found a secluded Industrial area where we could have some privacy and have fun with different dramatic poses. Both Richa and Sarin's wardrobe were perfect for the images with Sarin wearing a black suit and Richa in a long black and white evening dress. To me the wardrobe made the pictures sell the story. The last part of the session was a more casual and fun stroll through Bicentennial Mall State Park. Sarin and Richa still made casual look amazing as they were still dressed to impress. We took full advantage of the park's architectural highlights as we explored. After 4 hours of posing, laughing, driving, wardrobe changing and gun slinging, we felt we had some incredible images to share with her friends and family.